Experience the flavor & aroma of fresh ground coffee beans to brew your favorite coffee utilizing Bialetti's manual coffee grinder. The conical ceramic burr grinder crushes whole coffee beans into the desired coarseness, ensuring superior coffee flavor. Easy to adjust wheel to set for your preferred coarseness, whether course for coffee press, fine for the moka express or extra fine for the Turkish brew. This manual grinder is designed to utilize less effort, while creating more output. Measurement markings are located on the bottom chamber to indicate the amount of grounds needed for a coffee press, pour over, Moka Express and ibrik (Turkish brew). 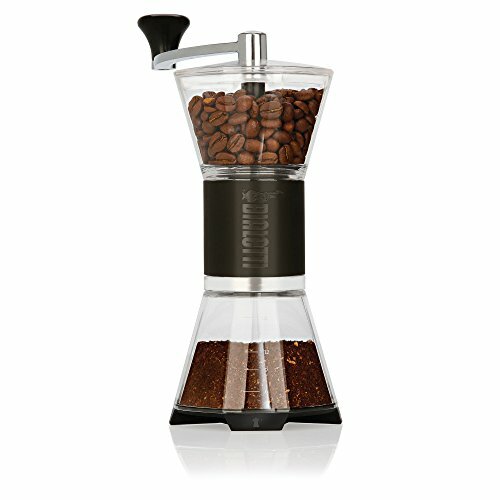 Start your morning coffee rituals with the Bialetti coffee grinder. Ceramic burr grinder with easy to adjust dial from fine to course.